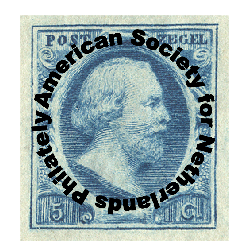 philatelists interested in all aspects of Netherlands philately. the Cape of Good Hope, and Dutch commercial establishments all over the world. The link between the members is our illustrated Magazine which appears every two months. It has articles on a great variety of subjects, as well as new issues, book reviews etc. as translations of interesting material that has appeared in other publications. in 2008 in Hartford, CT, and in 2010 in Los Angeles; both sites of a large APS show.